SunEdison on March 5 announced it is acquiring distributed solar energy storage systems provider Solar Grid Storage LLC, making it “the first renewable energy company to offer solar, wind and energy storage.” Investments being made by venture capital (VC) funds, including those backed by the likes of GE and Total, highlight growing corporate and investor interest in stationary energy storage as a new, up-and-coming segment of the renewable energy and smart grid market spaces. In related news, Tesla Motors made headlines once again this past week as it readies the launch of stationary energy storage solutions for use in homes and businesses, and ultimately, on utility electric grids. Tesla's stationary energy storage solutions will make use of the lithium-ion (Li-ion) batteries expected to roll off production lines at its Gigafactory, a battery plant the automaker is building near Reno, Nevada. Through its VC unit, France's multinational integrated oil-and-gas company, Total, is also putting an increasing amount of capital into innovative startups that have developed stationary energy storage solutions. “Quietly, Total is building a renewable energy powerhouse right under our noses,” Motely Fool's Travis Holum wrote in a March 3 post. Stationary storage: The key to opening the doors to a renewable economy? In addition to owning two-thirds of market-leading U.S. solar PV manufacturer and project developer SunPower, Total has an equity stake in Sunverge, which is working with SunPower to develop energy storage solutions. Total has also invested in Millbrae, California-based Stem, whose sophisticated energy storage network platform is said to be capable of managing heterogeneous fleets of geographically dispersed energy storage assets installed at utility customer sites. A new generation of distributed battery and other energy storage solutions is providing the key “missing ingredient” needed to build distributed, local microgrids fueled by solar, wind and other renewable energy generation sources. Further up in scale, “intelligent” energy storage systems are being tested in the field by grid operators and utilities in California, Hawaii, New York and other U.S. states. Utilities traditionally rely on fossil fuel-fired generation capacity to assure a steady flow of electrical energy across grids, as well as sources of power in emergencies. But grid operators, regulators and utilities have increasingly come to see advanced energy storage as a more effective, more efficient and more environmentally friendly alternative. 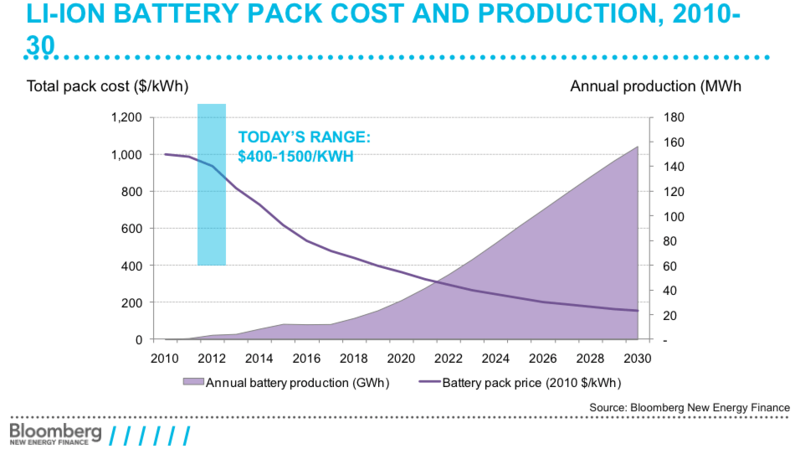 According to a June 14 market forecast from Bloomberg New Energy Finance, annual global investment in stationary grid energy storage will rise to reach $5.1 billion come 2020, over 17 times that for 2013.